Turn your Christmas tree into a Crèche tree! How many paper nativities you can get on your Crèche Tree! I have been spending pleasant hours during my pre-Christmas travel hiatus to work on the redesign of Crechemania.com. Your response to the new, easier-to-navitage design? Overwheliming: in just a few days, almost 2,000 free downloads have been sent out into the world by our servers. It really has been heart-warming to hear from so many of you, and I look forward to sharing your touching words with our Crèchemania.com enthusiasts in my Christmas Letter soon. Many of you have also asked to see my Crèche Tree Video, so hard to find among the HTML page jungle that is the old Crèhemania site. So I'm posting it here, and invite you all to put your feet up, sit back with some hot cider, coffee, tea — or your favorite beverage — and enjoy a visit to Crèchemania's living room. Have you been at the Metropolitan? Marveled at its glorious Neapolitan-crèche-adorned Christmas tree? Well, now you don't have to be a world-class museum to feature a stunning Crèche Tree: all you need to do is decorate it with your nativities! It's such a wonderful idea, I wonder, why I didn't think of a Crèche Tree before? You only have larger natitivities in your collection, to big to nicely tuck in your Christmas Tree? No problem. Use them to decorate the lower, larger, branches. Or, download and print all the Crechemania.com nativities, reducing the larger sizes to a perfect Crèche Tree size. 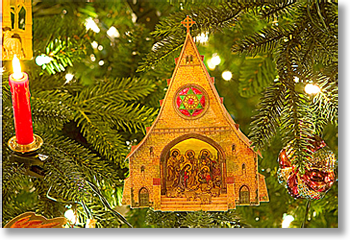 Many of the free Crechemania.com Downloads, like the Byzantine Crèche, would be perfect for your Crèche Tree. Charles Davenport, who lives near Athens, Georgia, just sent me a beautiful photo of the Byzantine Crèche he just created: "The really important thing I did was to have Kinko's print the Byzantine Crèche files on their semi-gloss cardstock," Charles says. "The inks are stable, vibrant, and the paper is wonderful to work with. Lit from above and the front, the colors of the Byzantine creche seem to glow! It's no photographic trick; that's how the crèche really appears!" I can just imagine it shimmering, lit by hundreds of Christmas tree lights. 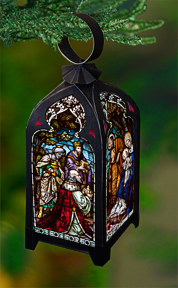 Inspired by a Ballermann paper model, this minature — 4.5 x 6 x 2 inches — features a cellophane rose window. The Ballermann & Son large sheet (No. 100K) features "En Julekirke"with Raphael's Madonna, and a transparent diorama of elves ringing Christmas bells. That's exactly what I did with the Julekirke (Christmas Church, see image at left), printing and assembling a 50% reduction of the synonymous Ballermann & Son paper model. A painting of Raphel's Madonna and Child adornes the back wall of the Ballermann Julekirke. But I wanted to house a nativity scene in the little kirke, so the painting of the Madonna, sadly, had to go. In its place, a yellow-cellophane window bathes the inside of the church in golden light. Behind the cellophane window I added a panel with a starry Bethlehem scene. The wonderful figures were provided by Maltézsky Betlém z Prahy, (Maltese Crib from Prague), which, of course had to also be scaled to the scale of the kirke. A kirke without a stained glass Rose Window? The Ballermann model features a nice but rose window, but it's printed, and I wanted it to shimmer with light, like the real item. 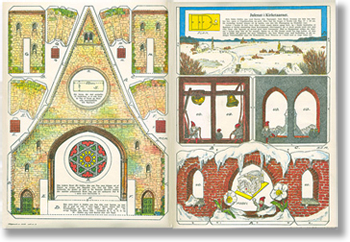 I'm sure the tiny pieces of cellophane that created the multicolored Rose Window would have been no trouble at all for all of our Miniaturists-par-excellence friends. But for me, working with miniscule yellow, red, and green bits of cellophane was an exercise in patience and perseverance. It didn't only have to contend with large fingers and tiny pieces, there was also static electricity that made the cellophane "panes" stick to each other like glue. It didn't help matters that I decided to to do all of the above after the kirke had been assembled. This afterthought meant installing my finished miniature Star of David Rose Window masterpiece through a small round opening on the back wall! Fingers felt like logs, and I had to secure the rose window with nay-invisible copper wires until I could glue it into place precicely in the center of the front opening. A thin wire assembly was also glued behind the top cross, to give it strength. The Ballerman & Son Julekirke needs to be mounted on heavier stock before assembly. Measuring approximately 10 x 16 x 4 inches, it gives an old-world touch to your Christmas decor. Its high tiled roof, pierced by ten gables and topped by an Irish cross — gives the Julekirke a distinct look. 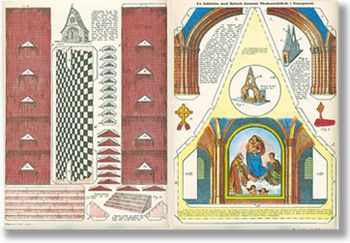 Four flying buttresses crowned by tiles add architectural interest, and another set of Gothic arches — not quite visible on the finished model — divide the inside of the church in two rooms. 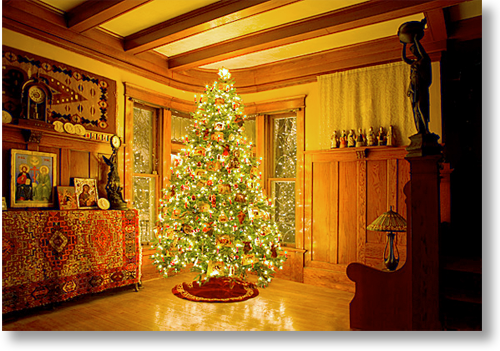 Now, let's see some photos of your Crèche Tree!